Presenting him with a game-worn, autographed Steelers Salute to Service 39THIRTY cap (with the camoflage bill) from Ben sounded like the perfect gift – the players wore those caps during the NFL’s Salute to Service month in November. 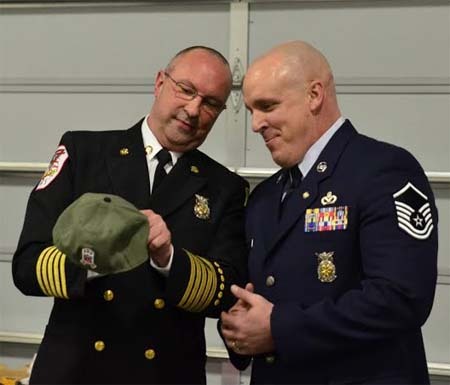 “MSgt Joel Harr’s retirement was yesterday 20 Feb, at which I gave him the hat signed by Ben. In attendance was his wife, children, his mother, father, and many other family and friends that traveled all the way from his home state of West Virginia. I wanted to thank Big Ben #7 once again, this really made Joel’s day, it was a wonderful retirement!” — Fire Chief McDougall. Congratulations to MSgt Harr, and thank you for your many years of service to our country!! God bless!